Look at that confident young man on the cover of No Way! Dressed in full funky regalia, caught in the action of playing a solid Gibson guitar, resolutely and in earnest. 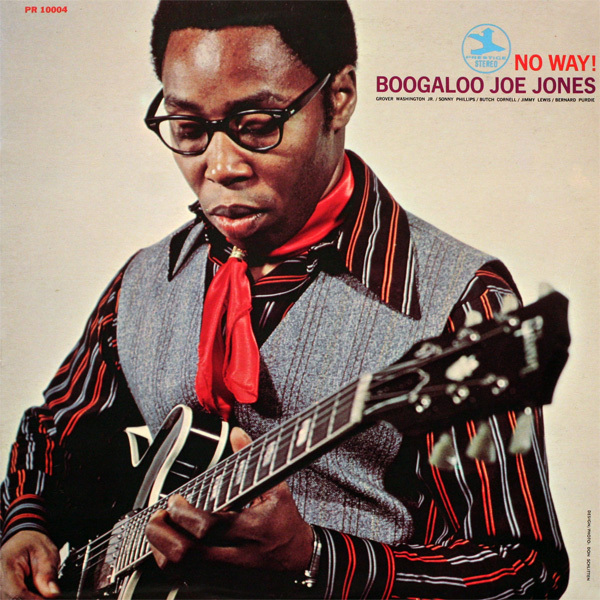 Boogaloo Joe Jones: sounds hip, dude. And the sleeve shows a man inclined to hit the big time. He wouldn’t, though. Boogaloo Joe Jones, sideman on a small number of soul jazz recordings, before disappearing into obscurity, nevertheless made a series of good albums for Prestige. No Way! is one of them. It shows an uncanny ability to inject the blues, which is the basis of his style, into a repertoire of wide range. It might take a listen or two to connect the party-hardy, viciously outgoing funk of the title track to the sweet and sour white boy’s blues of If You Were Mine – recorded earlier by Ray Charles who’d gone c&w himself. But then it clicks. In the former, there might be the risk of being blown away by the steamrolling tandem of funk jazz drum wizard Bernard Purdie and electric bassist Jimmy Lewis – a spicy stew – but Boogaloe Joe Jones devours it with relish and throws in punchy lines and fast-fingered licks. Its continuous climactic impulses might might wear one down a bit, but No Way! certainly rocks. Jones also does pretty well in the latter, in which his ‘twangy’ sound and inflected imitiation of the human voice is paramount to its innocent, hum-along charm. If You Were Mine also features a resonant solo by Grover Washington Jr. So here we have a hip-shaking and eloquent recording of funk, blues, pop and country, jazzed up by a guitar player who, by the way, supposedly was nicknamed Boogaloo chiefly to avoid confusion with the likes of Philly Joe Jones and Jo Jones. Keep good company is what my grandma always used to say.